MatrixBrute is arguably the most powerful analog monophonic synthesizer ever. As flexible as a modular system but offering presets, MatrixBrute is a dream machine for anyone interested in creating a sound palatte of their own. The MatrixBrute is just at the very beginning of its story but it is already growing stronger and stronger. Discover the new features brought by the firmware update 1.1. What is the most natural way to record music? If you instinctively thought “playing”, then no doubt you will appreciate using the real-time recording mode. Especially as we did our best to make it extremely convenient and super effective. Set the length of your sequence, press the Record and Play buttons in sequencer mode and let yourself float away with immediate inspiration. Of course, the real-time mode records the notes you play, but there is more. Holding a note during several steps automatically ties them while playing a note with a high velocity records an accent on this step. Also, the real-time mode also allows you to record the modulation track live by using the Modulation Amount knob. Our engineers gave in to the practice of a forbidden alchemy that gave birth to the Matrix Arpeggiator, an exclusive creative tool that will keep your creative juices flowing for hours on end. Simultaneously press the Arpeggiator and Sequencer buttons to discover this advanced benefit of the Matrix. The Matrix Arpeggiator playground is made of up to 16 steps, each represented by a column of the Matrix, and arpeggiated chords of up to 4 notes. 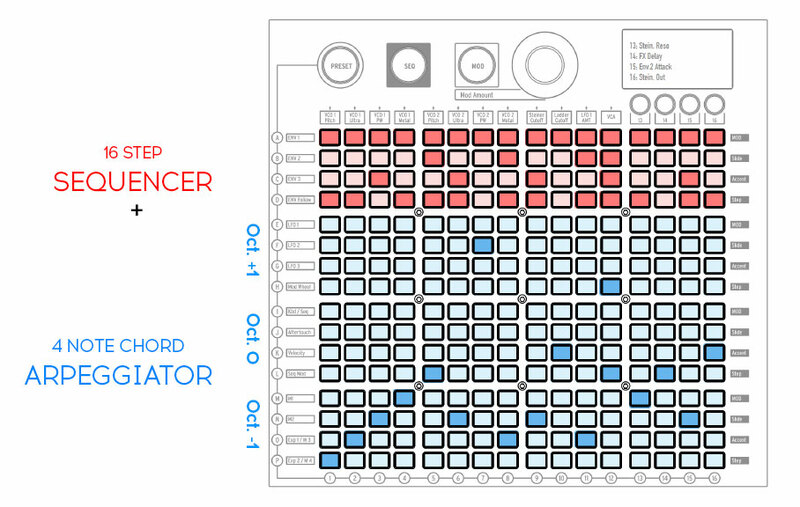 The four top rows work just like in standard sequencer mode for these 16 steps. The lower part can be divided in three groups of 4 rows. Each group represents an octave from -1 to +1 and the 4 rows within each of them symbolize the 4 notes of the chord you play on the keyboard. This way you can set which of the four notes of your chord will be played and on which octave for each step. Activating the Key Hold mode and playing different chords will allow you to create complex progressions in real-time while keeping a very consistent rhythm and melody. Looking from where you’ve come from is always practical when you want to locate yourself and find your way. It is also true for sound design. From now on pressing the Preset button and moving a knob or slider displays the distance between the current value of this parameter and the one that is saved in the current preset. 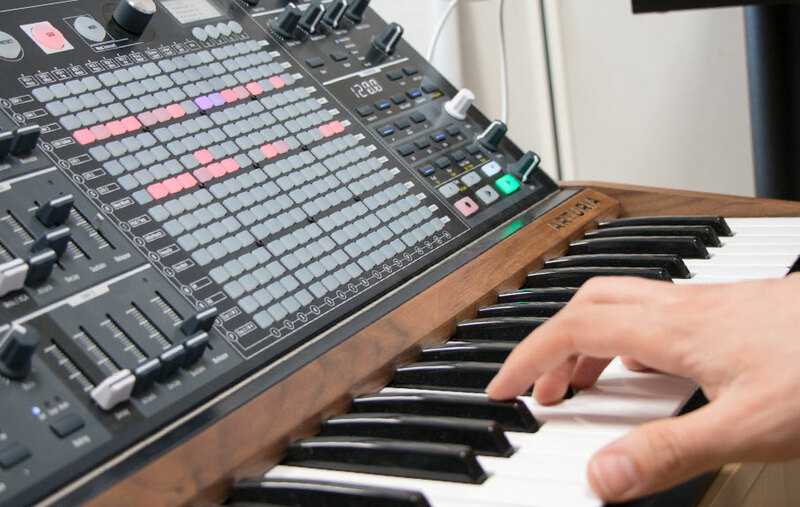 Whether it is to harmonize your connected instruments and modules with your MatrixBrute or just to make sure that all the members of the choir are in tune with the same reference, the ability to transpose the 0V-related note for the Pitch Outputs will undeniably be of great help. 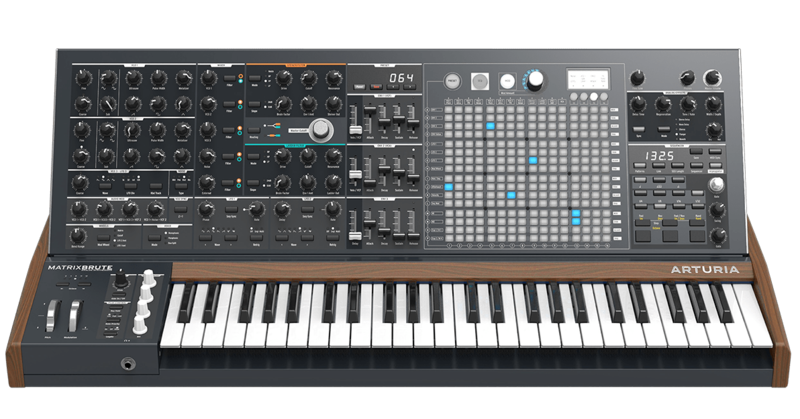 Connect your MatrixBrute to the Arturia MIDI Control Center and check the Device tab to access this parameter. You guess that is all? Well, you should not underestimate the MatrixBrute developer team, the list of improvement far longer than this! Have a look at the release notes on the MatrixBrute Resources page to check out the full list and do not forget to consult the latest version of the manual for learning, in detail, how to make the most of the new features. How to update my MatrixBrute? Updating your MatrixBrute firmware requires your unit to be connected to a computer on which the Arturia MCC is installed. Connect your MatrixBrute to your computer via the USB connection. Make sure not to use a USB hub. If it is not immediately displayed, select the MatrixBrute in the “Device” drop-down list in the top-left corner. The firmware section (just underneath) indicates the current firmware version and, if you are connected to internet, the latest firmware available. 1. click on the button “Download latest”. The MIDI Control Center will automatically download the latest firmware version. The first step will update the main board of your MatrixBrute. The progress is displayed through the progress bar. Once this part is done you will be asked to reboot your MatrixBrute. As asked, wait 5 seconds before clicking on the “OK” button. This will start the sub-boards update. At the end of this process a last reboot will finalize the firmware update process. You now have all you need to start using your fully updated MatrixBrute. We hope that you will enjoy even more your newly-updated MatrixBrute!